While searching for Mother's Day gifts, I came across a website that had personalized cookware. I was more excited to buy stuff for myself, rather than my mom and mother in law! Being that I will be celebrating my 30th next weekend (!!!! ), I did buy myself a couple things. 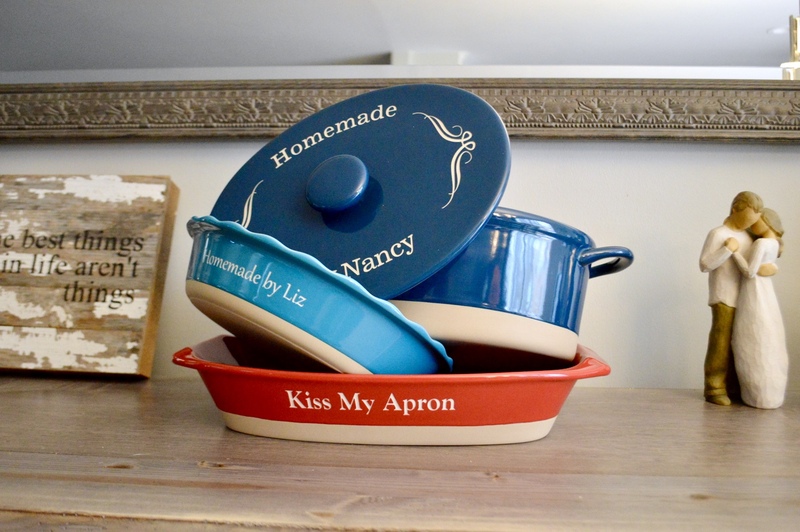 I am so happy with how everything turned out; a pie dish for my sister in law Liz, a pot for my mom Nancy, a baking sheet and personalized cover for my mother in law Debbie (not pictured), and a casserole dish with chili bowls for myself! I highly recommend Personal Creations for their cookware gifts! Great! Thanks for introducing with Personal Creations.